For effortless style team this Anna Rose moc shimmer top and cardigan with smart or casual bottoms. 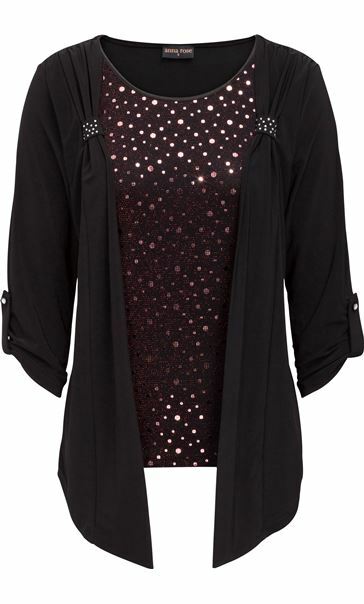 Crafted in a stretch fabric, the gorgeous cardigan has three quarter length tab sleeves, open front and embellishment detailing. The moc top is decorated with silver and red colour shimmer circles and has a round neckline, a must have for your occasion wardrobe. Back length 63cms. Something a little different with a little sparkle. Easy to wear and comfortable.